A nation divided. Protests against Donald Trump broke out around the country on Wednesday, November 9, after the controversial Republican candidate was elected president in a shocking turn of events early Thursday morning. Celebs including Mark Ruffalo also got caught in the mix. 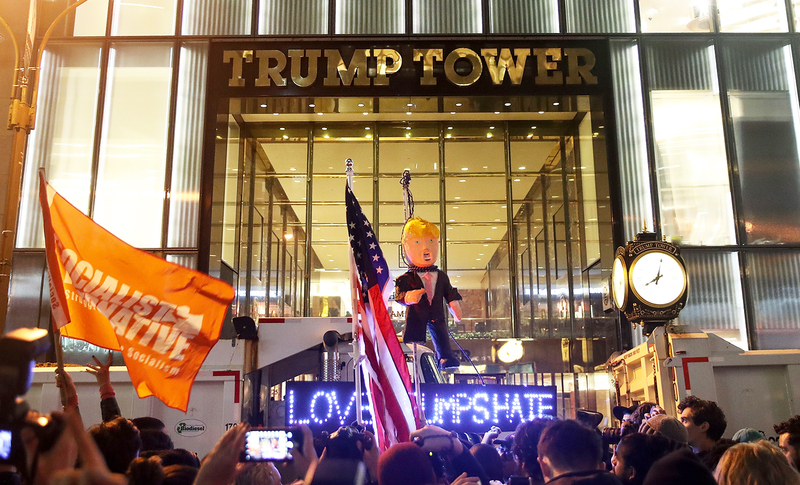 “Love Trumps Hate love fest NYC Thousands in the Street,” the actor captioned an Instagram video of thousands of protestors crammed together outside of the Trump Towers on Fifth Avenue. Love Trumps Hate love fest NYC Thousands in the Street. Madonna also shared an Instagram video of thousands shouting “Not my president” in the middle of NYC. “Need to Turn these Words into Action……….So Now What? ??????  Rebel ❤️&apos;s Unite. N.Y.C. Start A Revolution of ❤️,” she captioned the video. Need to Turn these Words into Action……….So Now What? ?????? ???? Rebel ❤️'s Unite. N.Y.C. Start A Revolution of ❤️????????????? Julia Stiles, Questlove and Jamie Lee Curtis also posted videos of the revolt to their Instagram accounts. The upset comes after Trump was elected the 45th president of the United States after defeating Democratic candidate Hillary Clinton, who was projected to win for weeks leading up to election night. In her concession speech on Wednesday, Clinton urged her supporters to accept Trump as president, reiterating to her supporters that Americans are stronger together. President Barack Obama also spoke about Trump, urging Americans to remember we are one nation.